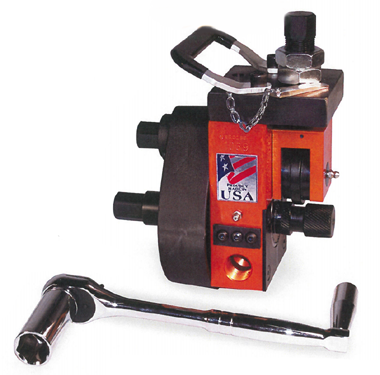 The PACE 1039 Mini-Mite™ is a self-contained portable roll groover that is two tools in one! It features rugged construction with a larger top roller bearing, heavier top slide, and more material in the housing to make for more durability. And all hex drives on this robust unit are 15/16" so one wrench fits everything! The PACE 1039 Mini-Mite™ portable roll groover is simple to operate. It rolls grooves 1-1/4" to 6.00" Schedule 40 or thin wall steel pipe and/or 2.00" - 8.00" Copper tube on the scaffold or anywhere power is unavailable. It also has the ability to chuck in a Rigid 300 - in just seconds (no gearbox removal). 1039-812 Mini-Mite™ Roll Groover for 8.00" - 12.00" Schedule 10 Thin Wall Steel Pipe NEW!